Duty of Care: Are your employees safe? Under the Corporate Manslaughter and Corporate Homicide Act 2007 employers are legally required to provide sufficient protection for their employees, however this can be increasingly difficult given the mobile nature of the modern workforce. 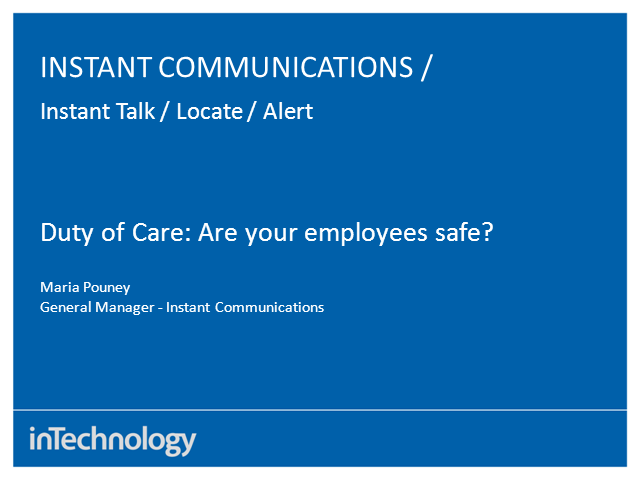 This webcast explores some of your legal obligations and considers how Instant Communications technology can help protect your lone/mobile workforce - insuring you are fulfilling your legal obligations, whilst improving efficiency at the same time! Title: Duty of Care: Are your employees safe?